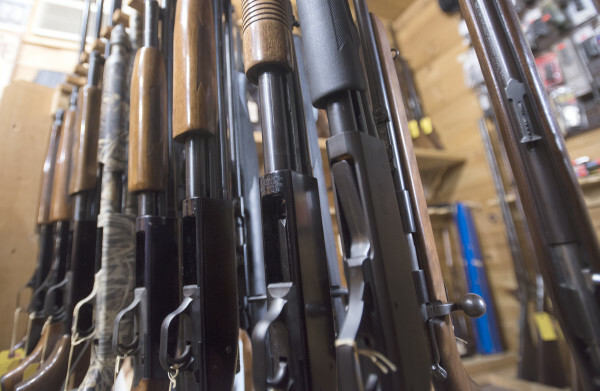 Rifles and shotguns for sale can be seen recently at Bill's Gun Shop in Orrington. A coalition of groups seeking to place the citizens’ initiative on the ballot submitted more than 84,600 signatures, 65,821 of which were deemed valid by the secretary of state’s office — more than the 61,123 threshold required for ballot placement. Under current state and federal law, anyone who buys a gun from a federally licensed firearms dealer, including retailers such as Wal-Mart or Cabela’s, must first be cleared by the Federal Bureau of Investigation’s National Instant Criminal background check system. Those who buy or sell guns in private sales, including those offered in classified advertisements in print or online, are not required to submit to an NIC check. The citizens’ initiative, spearheaded by Maine Moms Demand Action and the Maine Gun Safety Coalition, would mandate a background check before a firearm sale or transfer between individuals who are not licensed as firearm dealers. The parties would be required to coordinate with a licensed firearm dealer, who would conduct a background check before the sale could be completed. The proposal includes exceptions for transfers between family members, firearms loaned between parties while they are hunting or sport shooting, for emergency self-defense and some other circumstances. The petitions for An Act to Require Background Checks for Gun Sales had been in circulation between October 2015 and January 2016. The background check question will likely join other citizens’ initiatives on the November ballot, including measures seeking to implement ranked-choice voting and raising the state minimum wage. Maine election officials previously validated signatures for those initiatives. Now that the signatures have passed muster with the secretary of state, the proposal will go to the Legislature for consideration. In almost every case, the Legislature takes no action on citizens’ initiatives, clearing the way for them to go to voters as ballot questions. Signature submissions for initiatives to legalize the recreational use of marijuana, add a casino in southern Maine and increase public education funding await validation rulings by the secretary of state’s office.